It’s loud, busy, has more subway steam than a bad rom com could dream of, and… Holy cheese on toast we bloody love it. In fact, we love it so much we’ve dedicated a good chunk of time to eating there (a most noble pursuit, we know). And when we say ‘eating’ we of course mean burgers. 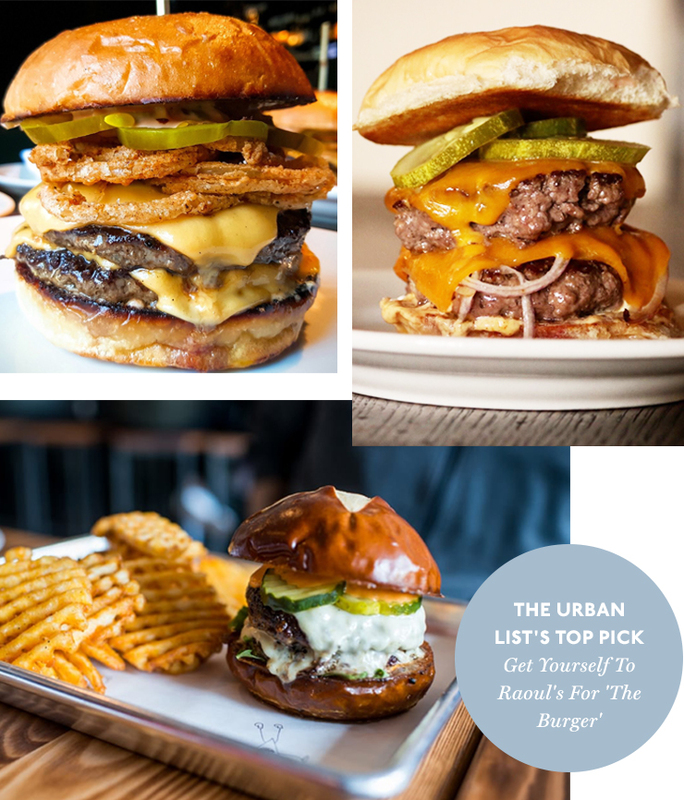 We therefore felt it our mission, nay duty, to compile a list of the best burgers ‘New Yawk’ has to offer. After all, New York is a concrete jungle where dreams* are made of. It may be known as a bare-bones cheeseburger but don’t be fooled gentle traveller, this prize of meat and bread is worth it. There’s no lettuce, tomato or even onion at this April Bloomfield-run joint and while we Aussie’s are used to our burgers dripping with toppings, we once again have to promise you: it’s worth it. The Chargrilled Burger comes with a SUPPERRR thick beef patty topped with Roquefort cheese in a fresh-baked bun and is buried in avalanche of shoestring fries. Basically, this burger is hella thick and hella good. Fedora Burger is one for the Aussie looking for a burger that’s styled a little closer to home (especially if that home includes plenty of red onion and pickles). The Fedora Burger is made up of a juicy AF Pat LaFrieda (famed meat purveyors) patty topped with smoked cheddar and BBQ mayo, red onions, pickles and a toasted, flattened bun. You’ll be struggling between shoving the shoestring fries into your mouth—eight at a time or not at all—and diving head first into the burg itself. P.S. Bar Sardine also have a pretty sweet veggie burger with raclette and pickled beetroot. P.P.S All their cocktails are Star Wars themed and we’re geeking out. Cards on the table, we’re still not sure what ‘bash-style’ means but lawdy, do we know we like it. Burger & Barrel's lower Manhattan burg’ features sweet onion and bacon jam – we know, tasty AF, but stick with us – pickles, American cheese and it’s very own ‘special sauce’. Not enough? Maybe the BMC is more your style? This one features a 40-day, dry-aged beef blend, tomato aioli, griddled onions and raclette cheese. You know what? Better be safe, we’ll have one of each. Before we begin we have to lay one thing out. This burger is so magnificent, they only make 12 of them a night. Twelve. And available from the bar only at Raoul's. Seriously, just an easy dozen of what is arguably a world class feed. The Burger (somehow, it deserves a capital letter) comes with watercress, cornichons, a rich, triple cream Saint Andre cheese, red onions on a challah bun. If you manage to get your hands on one, eat with reverence. If you like a burger that looks like it could take you on in a physical fight to the death, well then…. This burger is for you (and therapy. You should probably look at therapy). The Billy Burger is a glorious monstrosity with grilled onions, cheddar cheese and two8two sauce (similar to a Big Mac sauce). Not only is this bad boy swimming in onion but the patty is a house-blend, ground daily by local butcher Los Paisanos. If Sydney’s Frankie’s Pizza By The Slice had a drinking buddy up in NYC, without a doubt, it would be Boilermaker. Hooked? We haven’t even gotten to the burger mates. This double will set you back a breezy $11 (US mind you) with an extra buck for cheese and bacon. It’s tidied off with pickled vegetables, a signature sauce, lettuce, tomato and onion. The representative from the pizza biz has entered the game—bet you didn’t see that coming. While yes, the pizza at Emily’s is nothing short of ah-mazing! We can’t look past the burger. The Emmy Burger is made with a dry-aged Fleisher’s patty, positively dripping in Grafton cheddar and boasts sweet, caramelized onions. It’s all topped with a buffalo-esque Emmy Sauce and nestled inside a pretzel bun. Is this entry to our list technically cheating as its kind of the same as the above? Yes. Do we regret it? No. Emmy Squared is the Williamsburg version of the West Village classic and if we thought we liked the pretzel bun before, we were wrong. So wrong. The Le Big Matt is a must-experience for travellers, NYC natives and, people who enjoy the near unassailable in life. You’ll get a double-stack of grass fed beef patties, American cheese, greens, Sammy Sauce (kind of like Thousand Island dressing) pickles and a side of waffle fries. A more Aussie-style burger, closest in style to Grill’d, compared to some of the other ‘just give me beef’ burg’s on the list, The Upland burger is the first on this list to feature avocado (thanks to its Californian roots) and has the tick of approval from Obama himself. The double-patty burger comes with American cheese, lettuce, tomato and avocado. Basically, these guys know what they’re doing. If you can't get to New York for dinner, give this recipe a go.